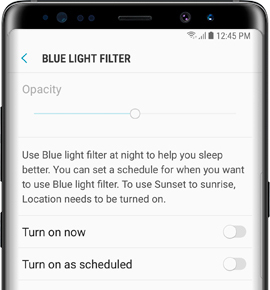 Galaxy Note8: How do I use the blue light filter on my Samsung Galaxy Note8 (SM-N950W)? Been having some sleepless nights? Your phone may be the reason. Blue light emitted from your phone can keep you alert and prevent you from getting any shut-eye. Use the Blue light filter at night to relax and get a good night’s sleep. You can even set a schedule so this feature automatically turns on and off. Sleep tight!